Patricia Flaherty Pagan is a talkative introvert who enjoys writing and reading about strong women. She is the author of Trail Ways Pilgrims: Stories (The Crossroads Collection #1) and Enduring Spirit: Stories (The Crossroads Collection #2), as well as several award-winning literary, fantasy and crime stories. She offers developmental editing services to emerging writers. Pagan is the facilitator and curriculum developer for Crafting Strong Women, a series of generative writing workshops to help writers enrich and deepen their depictions of female-oriented characters. She also teaches short fiction writing at various writing centers. 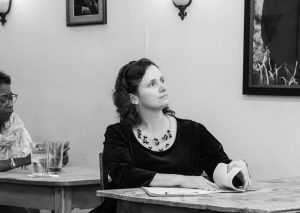 After earning her MFA in Creative Writing from Goddard College, she founded feminist publisher Spider Road Press and the annual Spider's Web Flash Fiction Prize.